Capsule Summary: Everyone at the 4077th is working hard so Colonel Potter schedules a movie as a special treat. When the projector keeps breaking down, the camp must provide its own entertainment. “Movie Tonight” is widely regarded as a classic episode of M*A*S*H, although there may be some fans who don’t like how silly it is. Personally, I’ve always loved it even though I recognize how unlikely it is that so many people could so quickly come up with such brilliant song lyrics on the spot. I’m more than willing to suspend my disbelief. There’s a plot to this episode but it’s a thin one. Although not mentioned, there must be a lull in the fighting if the staff feel comfortable taking the time to clean the OR from top to bottom. All that work has everyone bickering and fighting. Fortunately, Father Mulcahy manages to track down the mail and with it a copy of Colonel Potter’s favorite movie: My Darling Clementine. At first, the movie doesn’t draw much of a reaction. The nurses are more excited about an I-Corps dinner where they’ll get to see new people. Frank invites Margaret to sit with him but takes things too far when he suggests after the movie the two play “war games” like they used to. He then makes fun of Donald Penobscott’s last name, which is kind of funny. He later takes out his frustration on Radar, berating him for not finishing his peas. Even Hawkeye and B.J. seem a bit snippy. Once the movie starts, however, the whole camp gets into it. So of course the projector fails. Poor Klinger is bombarded with popcorn and catcalls as he tries to fix it. Colonel Potter attempts to keep the jocular mood intact by ordering everyone to sing “Tennessee Waltz,” which they do. The highlight of the episode is the camp singing “Gee Ma, I Wanna Go Home” when the projector fails again. Father Mulcahy kicks things off with a verse about being a chaplain in the Army. Hawkeye and B.J. follow with a verse that fits Hawkeye more than B.J. Colonel Potter sings about his horse, the nurses sing about choppers, Radar sings the praises of corporals, Klinger sings about wearing dresses, and Margaret sings about getting married. Later, after a few of Radar’s impersonations, Frank jumps up and starts singing his own morbid verse about stabbing Hawkeye and B.J. in the heart. If you go back and watch Frank closely while everyone else is singing “Gee Ma, I Wanna Go Home” you’ll notice he doesn’t seem very enthused, particularly after Margaret’s verse. The Father Mulcahy Soundalike Contest is hilarious. I think Radar does the best impersonation. Frank sounds like Minnie Mouse. Everyone is having so much fun the nurses would rather stay at the 4077th than go to their I-Corps dinner. Margaret’s performance of “C’est Magnifique” is, I think, intentionally longer than it needs to be. To the untrained ear, Loretta Swit sounds like she has a good set of pipes. As the episode comes to a close, the movie reaches its climax. A massive shootout on screen has everyone in the Mess Tent pretending to be a cowboy. Margaret mows down Hawkeye before being shot herself. Frank is either shot in the throat or chokes on popcorn. Radar enthusiastically blasts away with a six-shooter. It seems bizarre that these doctors and nurses who see so much death would get so much enjoyment out of pretending to kill one another and play dead. That’s exactly what the writers were going for, of course. The 4077th deals with death on a daily basis. They would never make light of killing and dying but watching a violent movie and playacting allows them to blow off some steam. When actual wounded arrive moments later, they all jump up and head to surgery, the fun over. The episode ends with one final song, a somber rendition of “My Darling Clementine” sung softly by the doctors and nurses as they try to save lives. It’s a moving ending to an otherwise jocular episode that borders on the absurd at times. 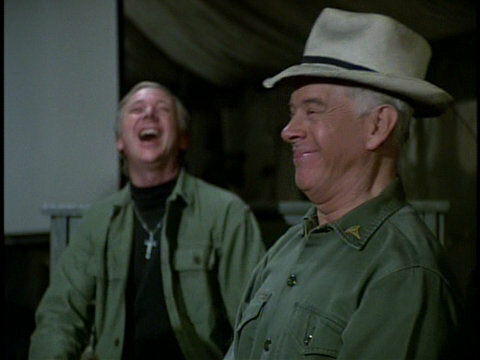 In my opinion, it deserves to be called one of the classics of M*A*S*H.
There have to be so many great stories about the making of this episode. Did the cast enjoy filming this episode? Was anyone apprehensive about having to sing? I’m especially curious about how the script was written. Gene Reynolds, Don Reo, Allan Katz, and Jay Folb are credited with writing the episode. That’s an unusual number of writers. Reynolds, of course, was executive producer of M*A*S*H during Season 5. Reo and Katz were producers. Folb served as story consultant. Did the four work together to write the lyrics for the 4077th’s version of “Gee Ma, I Wanna Go Home” or was one person responsible? The music cue sheet for the episode offers no insight. I wonder if any verses were written but not used–what would Igor have sun about, I wonder–or perhaps alternate versions drafted but later discarded. The other two nurses are uncredited but one is Gwen Farrell. Radar’s imitation of John Wayne from McLintock! is an infamous example of an anachronism on M*A*S*H. The movie was released in November 1963, more than a decade after the end of the Korean War. When Margaret is singing “C’est Magnifique” and Klinger gets the projector working again, her shadow can be seen on the movie screen. This is one of my favorite episodes! 🙂 I think the absurd portions of the episode work well because (like you said) the camp is under high levels of stress and everyone needs to let off a little bit of steam. Gary Burghoff does a very good Col. Potter imitation and is probably the best one, but they are all really funny! And I love their version of “Gee Ma, I Wanna Go Home”. My sister actually figured out how to play it on ukulele, and I walk around singing it all the time. I do wish we had access to stories about the making of this episode, but I haven’t heard any before. This has got to be one of the absolute best episodes of the entire series – it’s a perfect go-to episode to watch to cheer you up if you’re feeling blue or down, I love it. There’s an interesting blooper from this episode: at one point when the projector breaks down again, Hawkeye yells at Klinger a split second before the movie screen goes black. One minor quibble I have is this: during the sing-along, Klinger’s verse is met with everybody booing and hissing, and throwing popcorn at him . . . that’s actually funny. When the clip was used in “Our Finest Hour,” they cut to the final refrain after Klinger’s verse, which begins with everybody clapping and cheering . . . not as funny. And I actually saw MY DARLING CLEMENTINE, maybe a year ago or so, I wanted to check it out out of my own curiosity – obviously, there’s a lot from the movie we didn’t even see in this episode. It was a fairly pretty good movie – I’m not really into westerns that much (though I did love THE GENE AUTRY SHOW), so I’m not entirely sure if this is a movie I’d go out of my way to see. Oh, and did anyone else besides me feel like Hawkeye’s shirt having one sleeve longer than the other seemed a little reminiscent of his sister sending him a sweater with a similar problem in “Mail Call”? I definitely agree: whenever I’m feeling down or I just need a break from the world, this is one of my favorite episodes to watch. 🙂 I never noticed the parallel with the episode “Mail Call” (but I don’t watch the earlier episodes as often, which is probably why). Ten years ago I was battling depression (partly due to a side effect of governmental acne medication I was taking), but I remember one night I was curled up in my dad’s recliner watching TV – this episode was on TV Land that night, followed by an equally funny episode of SANFORD AND SON (“Earthquake”), then I flipped it over to TBS for an episode of SEINFELD (“The Cigar Store Indian”); it turned out to be one of the brightest nights I had that entire year. This is one episode that I never get tired of watching. It is a fantastic episode, with lots of jocularity, yet the theme of war and the drama of it also peeps through, especially in the last, moving scene. As a person with a musical background, I always cringe whenever a piano is played, as it is so massively out of tune. In this episode, the piano is even more out of tune than usual, which gives it a real feeling of war, and the scarcity of good entertainment! On the topic of music, Loretta Swit doesn’t have the best ‘set of pipes’ in my mind. Listen to her rendition of ‘My Blue Heaven’ in ‘Dear Dad, Again’ and you’ll see what I mean. But in this episode, she seems to have had some singing lessons, and it is (kind of) nice. I have a limited musical background but I attend the theatre as often as possible. Loretta Swit sounds to me like a good singer trying to sound like a bad one, which I’m told is quite difficult. According to IMDB she trained as a singer at the American Academy of Dramatic Arts. I just found out that from 1983-1995 she was married to a man with the last name Holahan. Pretty close for coincidence. Dennis Holahan, they started dating around/after the episode he appeared in, “U.N., the Night and the Music”, and eventually married. I agree that this is a great episode! And I happen to have a copy of this script in my collection. I pulled it out and flipped through it, and the writers of this episode did a great job of keeping the episode held together. In the front of the script is a sheet with the words to Tennessee Waltz. Then, in the script where they sing it, it just says that they sing the song together. As far as the army songs and the impressions, they were written in advance and the actors delivered them perfectly! Margaret’s solo does not include the words, so she other received a separate sheet or she already knew the song. With scripts, it’s interesting. Some of them have quite a few changes from script to screen. This one has very few, if any. Certainly due in part to the great team of writers who put this episode together. This is easily a top 10 favorite of mine, no doubt about it. Just a great, great episode. Fantastic the whole way through, though “Gee Ma” and the Fr. Mulcahy impressions are particular highlights. There is one thing that irritates me, though: watch after Klinger sings his part in “Gee Ma.” When everyone starts yelling at him, Alan Alda in particular is just GOING OFF. I mean, geez, I know they want to get back to the movie, but can’t Klinger join in the fun for a moment? That small moment aside, this one hits all the right notes with me. Pure, classic M*A*S*H! My dad is a life long movie buff, so this was his favorite duty in the military. I like how the MASH writers incorporated watching movies into some of the scripts and I’ve always enjoyed this episode. I saw “My Darling Clementine” about 33 years ago in a film studies class. Like most movies, it is definitely a lot fun to see projected on a screen and with an audience. It’s a great choice for a movie to be shown in this episode. This is an old military song, for which you can probably find dozens (or more) verses, since anyone with such a flair could add their own. So it is not unbelievable that many people would have heard/learned lyrics pertinent to their MOS. (I recall hearing this song, with lyrics suitable to the locale, in summer camp in the mid sixties. You know he’s such a twit. As for Margaret’s singing, notice she always has to be practically dragged off stage once she starts. This one is definitely a classic. Maybe it is unrealistic that everyone could come up with so much off-the-cuff talent, but so what? It’s a fun episode. 1. Margaret’s song and her determination to finish it, even after the movie started back up. I also love Hawkeye’s lusty over-the-shoulder comments. 2. Radar’s version of Father Mulcahy. 3. Frank’s pathetic attempt at zinging Hawkeye and BJ through song. 4. The nurses deciding to stay at the camp. It represents that the unit had great camaraderie, in spite of everything. By the way, Judy Farrell was quite the looker. This might be the most screen time she had in the whole series. Continuity Error: At the beginning of the episode when they are cleaning the OR, the floor is clearly made of concrete or some other hard surface. It certainly isn’t wood, which contradicts at least a few episodes. Yes, she was…as was Enid Kent as Bigelow. He traded her in for Shelley Fabares. BTW, Judy Farrell’s maiden name was Hayden, and I’ve read that her father’s name was Floyd Hayden, which was also Peg Hunnicut’s father’s name, so Mike Farrell’s & BJ Hunnicut’s fathers-in-law had the same name. And, Judy Farrell was born in Quapaw, Oklahoma…which is where BJ called his father-in-law to get help with Col. Potter’s horse when she was down with colic. The “Nurses through the night” line might have fit better with Hawkeye and Trapper rather than BJ. At my Boy Scout summer camp in 1977 we sang a version of the “Army Life” song, starting with a verse about “Good ole Camp Parnell…Some people think it’s heaven, but other thing it’s wellll…” (chorus with “Camping” substituted for “Army”). The only other verse I can remember was about our program director, Russell, “They say he’s pretty cool…but I’ve met nicer people in military school…” (chorus). I hadn’t seen this MASH episode yet, but obviously a member of my troop had, so he came up w/ this idea, and we had a lot of fun performing it that week. The puns are out of hand in this episode. Mostly BJ but Hawkeye too. Proving once again that old adage about 0 the lowest form of humor. I finally understand what Alan Alda meant when he said that the writers after Gelbart leaned on devoid of humor puns instead of trying to write funny bits. The actors seem to think if they fire them off really fast, we will laugh at their cadence and forget the lack of humor in lines like, “hey you got a pen? Why, did someone send you a pig?” I feel like I’m watching a crossword puzzle being done by an overachieving kid. Hey look what I can do with words, ma! Agreed! I think “Too Many Cooks” was literally written just to feature the ‘classic’ line “Our cook made food into a four letter word!”Not exactly Bennett Cerf or Fred Allen material. Perhaps that’s why no one guessed it. After all, Radar often knew things before they actually happened. Isn’t that why he was nicknamed Radar? I agree with all these comments! There’s something particularly special about this episode. POTTER: What’s goin’ on here, Burns? HAWKEYE: I saw the whole thing! Frank tried to eat Klingers mop! In reference to the number of writers of this episode, the lack of an ampersand or an and suggests each one wrote a seperate draft of the script. Love the bit at the end of all the songs and Mulcahy impressions: Klinger’s, off-screen I think, call-back to the Mills Brothers running joke Hawk (and I think BJ) ran with! I have no clue who the Mills Brothers are, but I don’t need to know in order to ‘get’ the joke.